This past March, Microsoft made the mildly surprising announcement that it is working on a Windows 10 Mobile ROM for the Xiaomi Mi 4. Back in June, a preview version of the ROM started rolling out to beta testers and early adopters, but now it looks like Microsoft and Xiaomi are finally ready to launch the project to a wider audience. 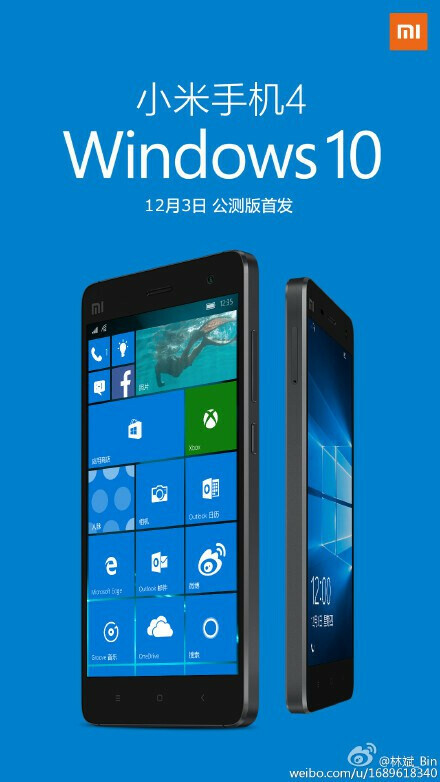 Xiaomi Founder and President Lin Bin recently posted an image on Weibo - a microblogging network that benefits from widespread popularity in Asia - suggesting that the Windows 10 Mobile ROM for the Xiaomi Mi 4 will launch on December 3rd. As previously showcased, the preview version of Windows 10 Mobile ran smoothly on the Xiaomi Mi 4 back in June. We're interested in learning more about this final version of the Windows 10 Mobile ROM, but we're also curious to learn how Microsoft plans to expand this project beyond the Xiaomi Mi 4. As far as the hardware goes, the Xiaomi Mi 4, launched back in late 2013, remains a potent smartphone to this day. The handset features a 5-inch display with a resolution of 1080 by 1920 pixels, a Qualcomm Snapdragon 801 chipset paired with 3GB of RAM, 16 and 64GB internal storage options, as well as a 13MP primary camera. In theory, the Windows 10 Mobile ROM for the Xiaomi Mi 4 should run buttery smooth on the device, but even if this turns out to be the case, it remains to be seen if the Windows 10 ROM will gain any serious adoption among those who own the smartphone. What do you guys think? Will you be tempted to test out a Windows 10 ROM if Microsoft turns out to launch one for your current Android smartphone? Before most of MS's own Lumia's get Win10, the Xiaomi Mi 4 gets "official support". Great thanks MS, will really buy another Lumia. oh my apologies, let the wording get in the way that WP have been getting insider builds since Feb...and mine is ahead of the 950/xl builds. Shouldnt this rom work on other android devices with similar hardware? If it can.. it will get BB Priv in no time.. the key would be being able to have the keyboard work on the PRIV with a hacked ROM.. but once PRIV prices come down maybe worth a try. I will never try Windows 10 mobile with a Lumia for sure. You can grab a Xiaomi flagship at same price with a lower mid-range Lumia. Xiaomi will be a good partner for Microsoft, if they can deal with for upcoming phones. Lumia can't help Windows 10 to gaining market share. But the Lumias have the superior cameras. At twice as expensive devices. And the Lumias have more hardware features... Iris scanner, USB Type-C, the list goes on and on. Find me a Xiaomi phone with a 20MP snapper, 6in screen with min 1080p, all day battery and then some, security without need for custom rom, full install to sd card without need of root and not the half app that gets left on the device, while you're at it, throw in dolby surround sound recording. All for 230 bucks....now go...oh this includes any import fees etc I would end up paying. These devices never helped Windows mobile OS market share. It's still far behind. I find you a Lumia which offers SD400, 1GB RAM, HD display, 0.9MP front camera, 2200mAh battery, aluminium alloy frame for that price. Worse they shamelessly call it budget flagship and fools celebrate it. Did you recognize Lumia 830? Did you miss the best in category camera, with OIS? Surround sound recording, the sd card that goes to 128gb official support? or the battery that still lasts a long time despite its size? yes 720p hd. Glance screen, double tap to wake, wireless charging. You forget that windows doesn't need higher soc to run smooth, better? yes always, but smooth? nah. Or how about we talk about the Galaxy Grand Prime vs the Lumia 640, and start to talk about 'price'. Go find me any competitor to the 640 for 60bucks...I will wait. Visiting this page from my samsung s6 just made my phone download an aplication. It was blocked by the system. Is this even legal? I understand you make money from adds. This morning my phone got redirected to a site telling me i won an iphone 6s. No matter what i tried, the only solution was to kill the browser app. Came back, got redirected instantly to a spinning wheel same thing. I think people should know this things are happening. So, is this harassment even legal? Yea it's unfortunate but phone arena is unvisitable via a phone, incredibly ironic since this site covers phones (and you guys do an awesome job). I can understand them needing to pay the bills but it's beyond ridiculous now. Use an ad blocker if you're rooted and want to use chrome or use Firefox with the adblock installed. Sorry phone arena but your adds don't just slow down flagship phones, but redirect you else where. I downloaded by force 4 of their aplications in like 3 minutes. Happened to me on my iPad Air 2 a few times. Most likely you have a bad cookie on the device, force stopping the browser wont do jack, the temp info is still on the phone. Go to settings, applications, application manager, scroll to all, then scroll down to browser that you use or all browsers on your phone you should have two installed from OEM (internet and chrome), then tap on clear data. You should be good.....for awhile till some other webpage or PA does it again. A real threat to Android? LMAO, Xiaomi has no intention to stop using Android and going against it, nor do they have reason for that, their version of Android is good and users love it, plus it sells. Thumbs up for them giving an option to get Mi4 run W10 Mobile, but honestly only tiny tiny percentage of Mi4 owners will try it, and not everybody of them is even going to keep it. Getting Lumia 950/ 950XL running Android, now that would be a notable threat to an OS. Is this a "real W10M OS " or just a Android launcher?